Copegus (Ribavirin) capsules are used in combination with Interferon to treat patients with chronic hepatitis C.
Copegus capsules are used in combination with interferon to treat patients with chronic hepatitis C, who have not been treated with interferon previously, or who have had a return of hepatitis C, following successful treatment with interferon. Take this medication by mouth usually twice daily with food or as directed by your doctor. The dosage and length of treatment is based on your weight, medical condition, and response to therapy. Antiviral medications work best when the amount of medicine in your body is kept at a constant level. Therefore, take this drug at evenly spaced intervals. It is recommended that female patients or female partners of male patients take a pregnancy test before starting this medication. A pregnancy test should also be taken every month while using this medication and for 6 months after treatment ends to make sure no pregnancy occurs. Drink plenty of water while being treated with this medication; drinking water will decrease the risk of serious side effects. Read the Medication Guide provided by your pharmacist. Ask your doctor, nurse, or pharmacist any questions you may have about this medicine. 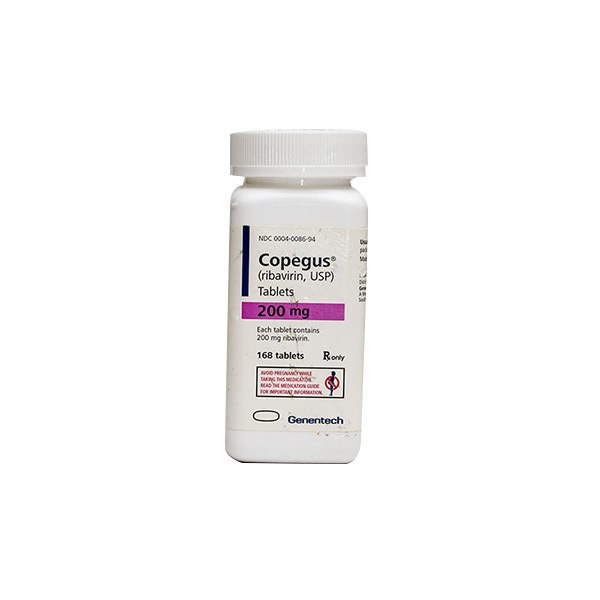 Copegus is an antiviral drug. It is used in combination with interferon for the treatment of chronic hepatitis C. Although the exact mechanism of its action is unknown, it is thought to interfere with the production and/or action of viral DNA and RNA which are critical to the survival and multiplication of the virus. Store at room temperature (77 degrees F or 25 degrees C) away from light and moisture. Brief storage between 59-86 degrees F (15-30 degrees C) is permitted. Do not store in the bathroom. Keep all medicines away from children and pets. This medication may cause birth defects and/or fetal death when used during pregnancy. Women of childbearing potential and their male partners must use two forms of reliable birth control (contraception such as latex condoms, birth control medication) while taking this medication and for 6 months after treatment ends to avoid pregnancy. Consult your doctor or pharmacist for additional information. This medication should not be used if you have certain medical conditions. Before using this medicine, consult your doctor or pharmacist if you have: severe heart disease, kidney disease, blood disorders (e.g., sickle cell anemia, low hemoglobin), other types of hepatitis (e.g., autoimmune hepatitis). Before using this medication, tell your doctor or pharmacist your medical history, especially of: other liver problems, heart problems, breathing problems, pancreas problems (e.g., pancreatitis), diabetes, any allergies. This drug may make you dizzy or drowsy; use caution engaging in activities requiring alertness such as driving or using machinery. Avoid alcoholic beverages. Caution is advised when using this drug in the elderly because they may be more sensitive to its effects. Caution is advised when using this drug in children because they may be more sensitive to its effects, especially the mental/mood changes, including severe depression or suicidal thoughts. This medication must not be used during pregnancy (see also Warning section). It is not known whether this drug passes into breast milk. Because of the potential risk to the infant, breast-feeding while using this drug is not recommended. Nausea, vomiting, headache, dizziness, blurred vision, stomach upset, trouble sleeping, and flu-like symptoms (e.g., fever, chills, sore throat, muscle aches) may occur. If any of these effects persist or worsen, notify your doctor. Tell your doctor immediately if any of these side effects occur: hair loss, loss of appetite, weight loss, rash, itching. Tell your doctor immediately if any of these serious side effects occur: unusual tiredness and weakness (fatigue), dark urine, yellowing eyes, mental/mood changes (including severe depression or suicidal thoughts), trouble breathing. Tell your doctor immediately if any of these unlikely but serious side effects occur: chest pain, muscle pain, joint pain, rapid breathing, stomach pain, easy bruising or unusual bleeding. An allergic reaction to this drug is unlikely, but seek immediate medical attention if it occurs. Symptoms of an allergic reaction include: severe rash, severe itching, swelling, severe dizziness, trouble breathing. If you notice other effects, not listed above, contact your doctor or pharmacist. Do not share this medication with others. Laboratory and/or medical tests (e.g., pregnancy tests, blood counts, hemoglobin) will be performed to monitor your progress and for side effects.